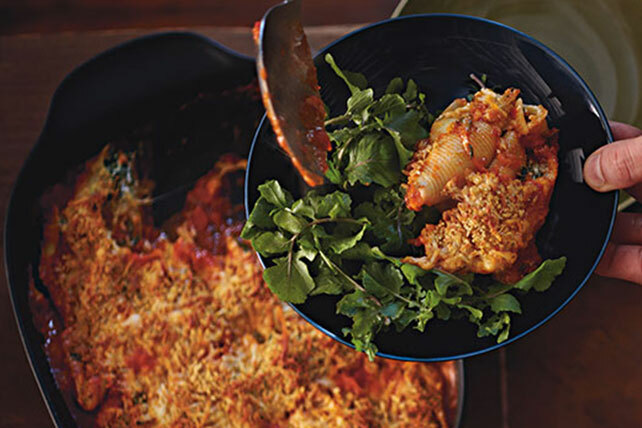 Seasoned panko coating mix gives these saucy and super-cheesy stuffed shells their deliciously crispy tops. Pour half the sauce into 13x9-inch baking dish. Mix coating mix, shredded cheese, Parmesan and seasonings until blended. Combine ricotta, spinach and 1 cup shredded cheese mixture; spoon into shells. Place over sauce in dish; top with tomatoes and remaining sauce. Cover. Bake 10 min. Top with remaining shredded cheese mixture; bake, uncovered, 15 min. or until heated through. Spray foil with cooking spray before using to cover casserole to prevent sticking.